This is a true account of wedding customs in a rural Missouri farming community prior to WWII, as told by Letty Owings, age 89. The account is limited to the small geographical area. Customs may have been different, twenty miles down the road. The usual refreshments and a small reception followed the wedding ceremony. A few days after the couple got settled, the community held a shivaree. The shivaree was a post-wedding noisy party for the community where the newlyweds were pressed into service as hosts. In short, the shivaree was a mock serenade and a roast of the newlyweds. People brought all sorts of noisemakers and pots and pans to bang on, and they sang songs and enjoyed refreshments, compliments of the newlyweds. Adding to the atmosphere of friendly ribbing and polite mockery, nobody bothered to dress up. Supposedly, the shivaree was spontaneous and clandestine. However, it was an organized spontaneous that wasn’t really a secret. Since the newlyweds were expected to provide the refreshments for their own roast, they had to know where to be and what time to be there. Community members organized the shivaree by word-of-mouth instructions. Everyone in the community had plenty of advance notice for this ‘spontaneous’ post-wedding party, and looked forward to the fun. Newlyweds looked forward to the noisy event as well, and they would have been insulted at not being forced to host the shivaree. No one ever came out and said, “There is a pall hanging over our social functions.” However, it was apparent. For one thing, people had a sense of unease about enjoying themselves at social functions while there was so much suffering going on in Europe, and the conversations often turned to that subject, even at the likes of a shivaree. Also, people began to be self-conscious about speaking German out and about. My father’s side of the family included ancestral illegal immigrants from Germany who did not care for German militarism of the time, so they bribed a ship captain and came to this country to escape it. They brought the language with them and the language sifted down through the generations, even to me as a young child. In one case, a boy’s folks did not want him going out with me, because of the German. We spoke Low German in the home when I was a child. It was lost on some folks that descendants of German people from generations past were a peaceful lot. The remnants of the language became associated with the current doings of a madman in Europe. Ray Owings, age 91, and Letty Owings, age 89, recall their memories before and after April 12, 1945, when US President Franklin Delano Roosevelt (FDR) passed away. 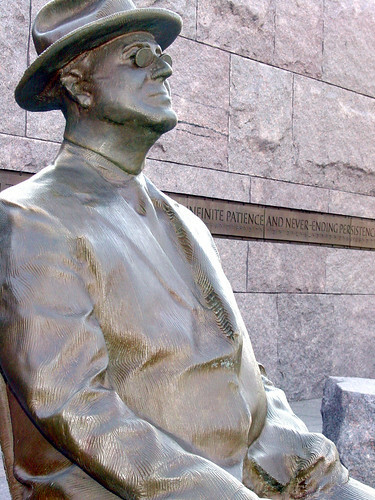 FDR was elected for four consecutive terms, and remains the only president ever to serve more than eight years. When Roosevelt was elected in 1933, my mother didn’t have voting rites, or at least that was how the culture viewed things at the time. At that time and in that community, women did not vote, even though legally, they could. My dad and my grandfather rode together in the buggy, to vote. My dad voted for incumbent Herbert Hoover, because Hoover was the popular candidate in the small German farming community where we lived, in Missouri. But then, FDR got it. In the coming years our lives became one leader, and one direction, and that direction was the war. When Ray got his orders in 1944, he brought me a dozen roses, to tell me. I ran out of the house to greet him. But, I was wearing slacks, and my mother followed me, irate, because she did not think that a man should see a woman wearing slacks. That is how our world has changed. I was in front of the wind charger radio when I heard of FDR’s passing. Ray was in the Pacific. In Fort Pierce, Florida in 1944 I was training a boat group of 160 men. They thought I was mean. I thought they were the dregs, but they turned out to be good. In December 1944, I got my orders, and we reported to the USS Lacerta. She was just being finished and they were loading stores in Norfolk, Virginia. We cleared Norfolk on January 18, 1945 and sailed to Cuba and then the Panama Canal before heading to Pearl Harbor where we loaded hospital crew and cargo for Guadalcanal, in the Solomon Islands. There is so much water in the world. On February 23, 1945 we crossed the equator and the international date line at the same time. On February 27, we arrived in Guadalcanal, unloaded cargo and picked up a group of Marines: a 155mm Howitzer artillery group, for the Okinawa invasion. We departed Saipan on March 27 and began to prepare for invasion. On April 1, we unloaded Marines from Guadalcanal onto the west side of Okinawa, where they joined others. There were kamikaze and also, kamikaze boats around us. The marine group on the beach needed ammunition desperately, and we lowered the boats to deliver the shells. A typhoon was close to us, the water was real rough, with 10-12 foot waves, and we were the only boat group at that time to be unloading. It was difficult in the rough seas, but we were able to do it. We departed Okinawa on April 9, 1945 for Saipan, and on our way there, we heard on the ship’s radio that Roosevelt had died. When we arrived in Saipan on April 20, I learned by a signal sent to the ship, that my first daughter had been born, in March. There was a time when right and wrong all got changed, a time when the rules of war and the international laws all went up in the air and generals fought with one another about how to fight.